The Enterprise escorts an extremely telepathic Betazoid, Tam Elbrun, as they race against the Romulans to make first contact with a living alien spacecraft. They measure telepathy in the future using an ESP scale? Couldn't they have found a more appropriate name? It's cool that Tam suffers from a Betazoid version of autism/Asperger's syndrome. It's an interesting bit of sci-fi. This episode has an unusually pastoral musical score. "Gomtuu" sounds an awful lot like "Klaatu." 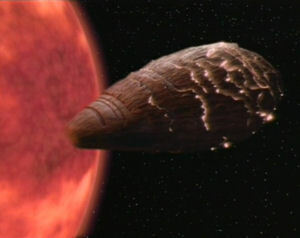 When Tam is onboard Gomtuu, it's a lot like how Troi reacts inside Farpoint station in "Encounter at Farpoint." Picard and the bridge crew spinning slowly across the bridge is really lame-looking. When Picard asks him what happened, Data says, "Difficult to explain, sir." Data would never say that. This isn't a bad episode. It's got a neat sci-fi idea and the character of Tam Elbrun is interesting. However, the plot pretty much ignores our main characters, choosing instead to focus on Tam. There's plenty of room to develop Data or Riker, but neither seems altogether affected by events. The writing needed to go a bit further. Also, since the writers of this episode are so critical of "Samaritan Snare," I will say that the writing in this episode is better, but "Samaritan Snare" is more memorable and more entertaining. This isn't the last time we will meet a lifeform that exists in the vacuum of space. There is another one in "Galaxy's Child."